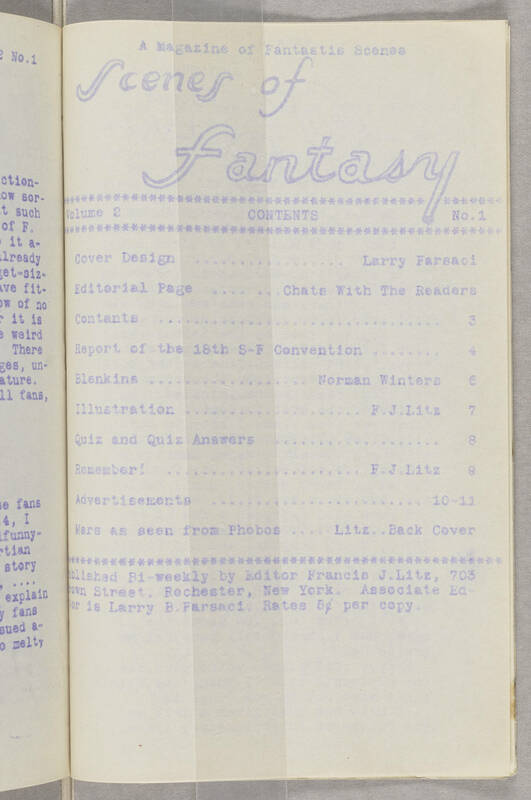 A Magazine of Fantastis Scenes Scenes of Fantasy Volume 2 Contents No. 1 Cover design ..... Larry Farsaci Editorial Page ..... Chats With The Readers Contants ..... 3 Report of the 18th S-F Convention ..... 4 Blenkins ..... Norman Winters 6 Illustration ..... F.J.Litz 7 Quiz and Quiz Answers ..... 8 Remember! ..... F.J.Litz 9 Advertisements ..... 10-11 Mars as seen from Phobos ..... Litz .. Back cover Published bi-weekly by Editor Francis J.Litz, 703 [Brown?] Street, Rochester, New York. Associate Editor is Larry B. Farsaci. Rates 5¢ per copy.